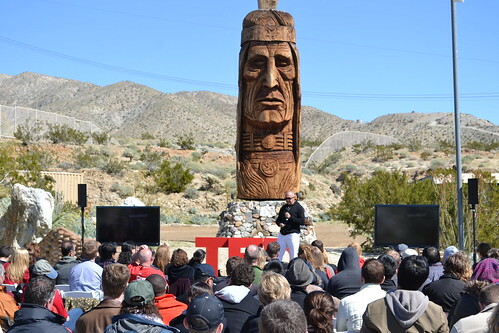 On Saturday, February 26th, we traveled from the great city of Cleveland, Ohio to Palm Springs, California to attend TEDx Workshops and of course, TEDActive 2011. 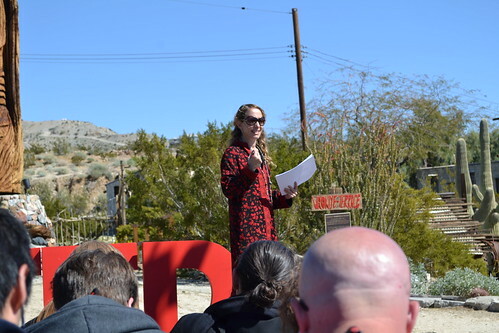 Sunday was our first full day, and we spent all day in the desert with 160 TEDx curators from around the world; presenting, collaborating and brainstorming. It was amazing to meet such a diverse group of people and learn from everyone. We made friends with people from TEDxNASA from Virginia, TEDxTC from Minneapolis, TEDxBoston, TEDxPSU from Penn State, TEDxSoweto from Africa and so many more! Here are some photos from the TEDx Workshop. 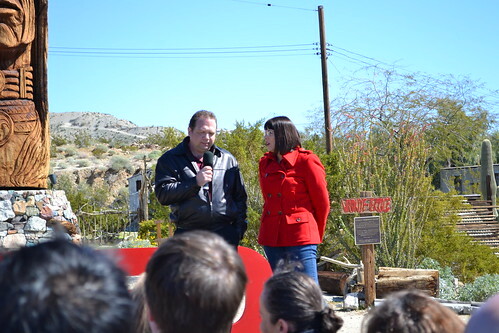 Below is a photo of our two new friends, Steve Craft and Hayley Foster of TEDxNASA discussing their event. One of their stories included people from India contacting them in order to stream TEDxNASA live in their village. It was incredibly powerful to hear what lengths people went to in order to share TEDx talks across continents. In addition to working with other TEDx curators, we also spoke with the TED organizers regarding current and upcoming initiatives, such as TEDxChange (the Bill & Melinda Gates Foundation TEDx event), TEDxYouth and the all-new TEDED, which was officially released to the public today. 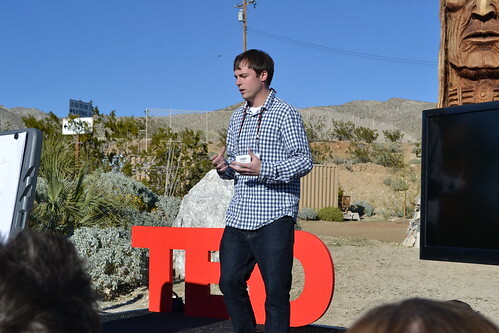 Here’s a photo of former TED Fellow, Logan Smalley, making the announcement to the TEDx Workshop last Sunday. 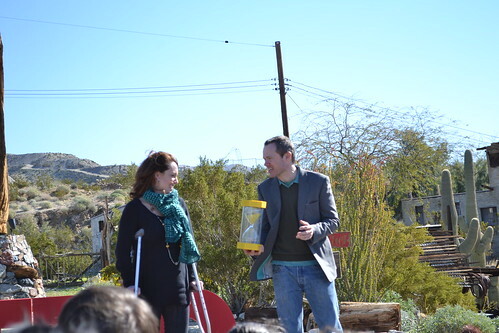 We also met the hosts of TEDActive, Kelly Stoetzel and Rives. Lara Stein, Director of Licensing at TED, and other TED organizers also shared great insight on the future of TEDx. Here is a video from the curator of TEDxDubai, to give you a taste of what we experienced at the TEDx Workshop. One of the most meaningful experiences we had was listening to Kelo Kubu of TEDxAccra, discussing the current environment in Africa and also the experience of curating a TEDx conference. In regard to curating the event, she shared the difficulties they encountered in hosting the event due to no electricity, and more importantly, the triumphs they had achieved in bringing people together within the community. TEDxAccra gave all of the TEDx curators a gift, which we are extremely grateful for, a beautiful necklace with great meaning. This necklace was made by Senegalese women between the ages of 13 and 21, whom live in a village called Kaolack in Senegal. They all earn under a dollar a day, but have the passion and creativity to make a living through creating these necklaces. Each day they collect varieties of small beads, recycled stones, strings and start putting them together. 95% of the women have no education and are very poor. Selling these necklaces give them money to live and make them self-reliant, and liberate them from the pressures of forced marriage. We ended the night with a great reception at the Lucille Ball House and got to meet many of the TEDx curators we didn’t meet earlier that day.